Steampunk: It's not as new, confusing, or weird as you may have heard. In fact, this sub-genre of science fiction is actually quite warm and welcoming - and it's loads of fun. So let's take a minute to talk about what it is, and where it came from. "Steampunk" is a style (of books, video games, comic books, movies, and more) that hearkens back to the fantastic/adventure literature of the nineteenth century. Jules Verne's stories about exploration and mayhem, H.G. Wells and his tales of alien invasion and time travel, and Mary Shelley's tome about science gone awry ... in these famous works you'll find the seeds of the modern steampunk sensibility. The above-mentioned authors and their literary brethren were writing science fiction – but they were writing it well before the microchip, the internet, or even in some cases, the internal combustion engine. Their idea of the future was colored by the technology they had at hand. In their day, steam power was the very height of innovation. Therefore, they assumed that steam would be the power source of the future. In the 1950s and 1960s, pop culture rediscovered the "feel" of these old stories, and began to revisit them with a mid-century flair. Some people point to the 1954 movie 20,000 Leagues Under the Sea as the first steampunk production, and it's a good contender – with the wonderful, weird, incongruous technology and Victorian vibe; and 1965's Wild Wild West television show demonstrated nicely that strange gadgetry and adventure tech didn't have to be British to be chock full of scope and charm. United Artists went back and did it again in 1968 with Chitty Chitty Bang Bang, a lighthearted throwback to the iconic retro mad science oeuvre. In the 1980s, a fresh band of writers took a look back at the first folks who looked forward. K. W. Jeter, Tim Powers, and James Blaylock in particular were having a marvelous time with these "Victorian fantasies." In fact, it is Jeter who is generally credited with coining the term "steampunk" to describe them. In 1987 he sent a letter to the magazine Locus, wherein he searched for a collective term for the fiction trend, saying it should be called by, "...something based on the appropriate technology of the era; like 'steampunks', perhaps." The 1990s saw fresh blood added to the field. William Gibson and Bruce Sterling's The Difference Engine in 1990 called attention to the possibilities; and Paul DiFilippo's 1995 Steampunk Trilogy brought the term to the forefront. And in 1999 Alan Moore and Kevin O'Neill's League of Extraordinary Gentlemen comics (and the subsequent movie in 2003) gave the world at large a very good look at what this whole "steampunk" thing could be. And now its popularity is surging once more, with renewed interest from publishers, movie studios, and video game producers breathing new life into steampunk – and it's poised to become more popular than ever. At least, I certainly hope so. My own steampunk novel, Boneshaker, hits the shelves on September 29, and I'm so excited I can hardly see straight ... so I might not be the world's most impartial source on the matter. But I do hope you'll take a chance on the next steampunk book or movie you see. You just might enjoy it, and find it more familiar – yet more exciting and different – than you ever expected. 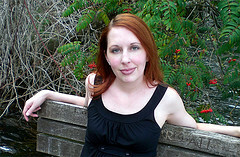 Cherie Priest is the author of seven novels, including Boneshaker and the Blooker-award winning Four and Twenty Blackbirds, plus Fathom, Wings to the Kingdom, and the Endeavour-nominated book Not Flesh Nor Feathers from Tor. Her short novels Dreadful Skin and Those Who Went Remain There Still are published by Subterranean Press. She lives in Seattle, Washington, with her husband and a fat black cat. She can be found online at cheriepriest.com and theclockworkcentury.com. Her novel, Boneshaker, can be found in all good US bookstores. Hi Cherie, Thanks for such an informative blog. Your post reminded me of a 'fact' I read years ago in our 1889 Chambers Encyclopedia. Under an entry talking about flight, the writer states with great authority that powered flight is not possible because the steam engine is too heavy. A mere 14 years later, the Wright brothers took to the air. I suspect the writer of the encyclopedia entry was not a fan of those early steampunk authors such as Jules Verne or he would not have been so definitive! Thank you for the informative post on steampunk. It's one of the best posts about what steampunk is I've read. I was not aware of this genre but it seems I read a few, if so, I think the best is China Miéville's trilogy. I LOVE LOEG so I guess I'm a fan of steampunk even though I didn't know this genre existed! Must look into all this further. Chitty Chitty Bang Bang is not Disney. Thanks lissanee, you're right - Chitty Chitty Bang Bang was from United Artists. I've made a correction.